The role of apprenticeships in improving the lives of young learners is high on the government’s agenda and in the wider policy world. Given this, the apprenticeship levy has received much attention and criticism since its inception. In fact, the Department for Education (DfE) is already having to handle calls for its reform. A year on from the levy being introduced, we delved into the latest statistics on apprenticeship starts from the DfE to see what kind of impact the policy is having. The levy requires firms with an annual wage bill of more than £3 million to pay 0.5 per cent into an apprenticeship service account at HM Revenue and Customs, which can later be redistributed in the form of apprenticeship training. Since the levy came into effect in April 2017, the number of apprenticeship starts has dropped starkly and this is negatively effecting the government’s aim of 3 million apprenticeship starts by 2020. Following an initial decrease of almost 60 per cent compared to the same quarter last year, the number of starts has improved somewhat but remains far below those seen before the introduction of the levy (Figure 1). 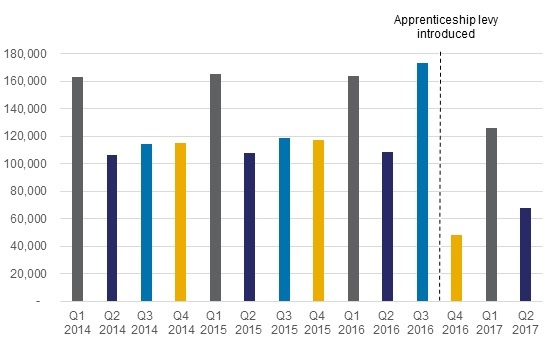 In the latest quarter the data is available for, apprenticeship starts remain more than a third below their level in the previous year. The quarters used in this analysis are academic quarters, so for example Q1 2017 is the first 3 months of the 2017/2018 academic year beginning in August 2017. However, these significant reductions did occur after a substantial jump in starts during Q3 2016/17, just before the levy was introduced. This could suggest that firms were somewhat apprehensive about the changes to the vocational system and possibly hired more apprentices before the levy was introduced to avoid having to adjust to the changes early on. It is plausible that firms are still adjusting to the levy and figures may well continue to pick up throughout the year. Source: DfE Further Education and Skills – March 2018. Dates refer to academic quarters, the latest full quarter of data available covers Nov 2017 – Jan 2018. 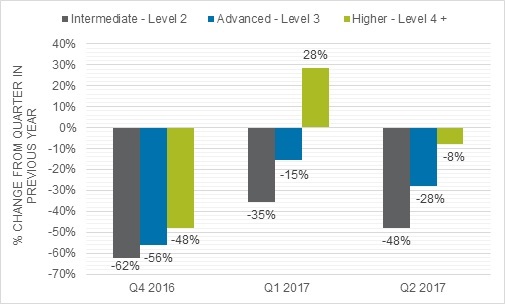 This fall in the total number of apprenticeship starts, particularly in the most recent quarter, is driven by a fall in intermediate (level 2) apprenticeships, down 48 per cent. In comparison, higher (level 4) starts have been more robust since the levy’s inception (Figure 2). However, given level 4 starts have historically only made up a very small share of apprenticeships, while this change has increased the share of higher apprenticeship starts, it remains small at 11 per cent, up from 7 per cent the previous year. Given recent research indicates higher level apprenticeships are associated with higher benefits for both the employer and the apprentice, work needs to continue to encourage employers to offer more of these higher level apprenticeships. Interestingly, less than half (40 per cent) of all apprenticeship funding in the last quarter was supported through levy funds. This share has also gradually fallen over the three quarters that the levy has been in place for. This aligns with the Open University’s findings that £1.28billion of the funding that has been paid into the apprenticeship levy is still sitting in National Apprenticeship Service accounts, unused. This equates to 92 per cent of the total funds generated through the levy as of February 2018. The introduction of new flexibility from April this year to allow employers to transfer up to 10 per cent of their annual contributions to the levy to one other employer, is being done in the hope that it will lead to more of the funds being spent. In particular, it is hoped that larger employers will support smaller employers in taking on more apprenticeships. However, with smaller employers already able to receive a subsidy to cover 90 per cent of their apprenticeships costs, and barriers such as low awareness of the apprenticeship process still hindering small employers, it will be interesting to see what the take up of this offer is. The latest data available shows that demand for apprenticeships is actually higher in the North. 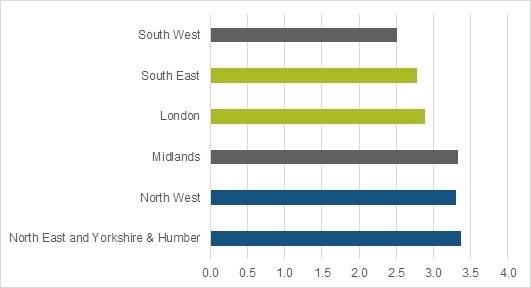 Despite having higher numbers of apprenticeships starts overall (Figure 3a), it is still in the North West, North East and Yorkshire and the Humber that demand most heavily outstrips supply, with these regions having the highest number of applications per apprenticeship vacancy (Figure 3b). There is already a North-South divide in terms of educational quality and the average skill level of the population, so creating training opportunities is arguably more important in Northern regions. Together, these two arguments have led to accusations that the levy has not been designed to create apprenticeship opportunities where they are most needed. 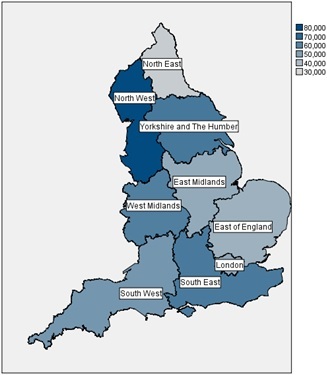 For this reason, it will be intriguing to see if the ability to transfer funds to another organisation will be used to create more apprenticeships in regions such as the North West, where demand is higher. Overall, it is still early days for the levy. Yet one year on from its introduction, the historical issues associated with apprenticeships – namely the level of apprenticeships offered and creating opportunities for young people where they are most needed – remain the same. The levy still has a long way to go if the government is to meet both its promise of providing high quality apprenticeships and its target of 3 million new apprenticeships by 2020.